A payment gateway is an ecommerce application that accepts online payments mainly through credit cards. It is usually a party between the buyer and the seller. Customers can view products online and pay at the same time - online. It should be noted that there are a lot of security measures that are taken to ensure that the process is safe. Payment Gateways encrypt the sensitive information of the credit card such that they are available only to the authority due to receive the information. 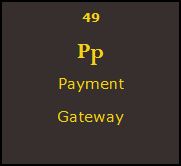 Nowadays payment gateways are very safe system of payments and is widely used over the world. At MYP we understand how a payment gateways can benefit both sellers and buyers hence we are offering Payment Gateways facilities. You must contact our service centre for more technical details and we will guide you through the process. You do not need to be a computer wizard to make use of a Payment Gateway, we will make things easier for you to be able to operate the system easily and take the benefit of the investment.